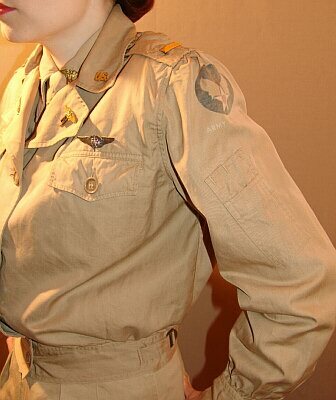 Initially, flight nurses were required to wear male flying clothes. However, male clothing items were unsatisfactory for female wear because they did not fit properly, did not conform to feminine military standards of appearance and were often too large for practical wear. 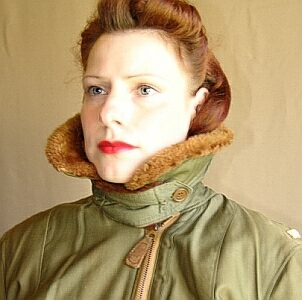 Therefore, several new types of special flying clothes for women were developed during the war. . 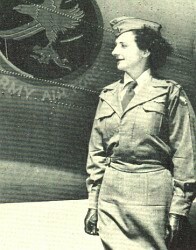 In June 1943, a blue woolen flight nurse's uniform was standarized. 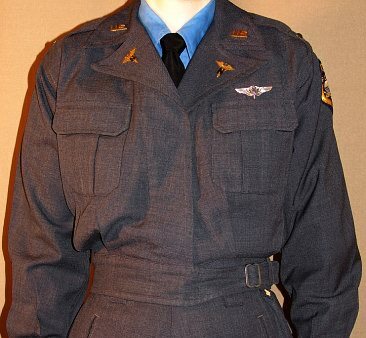 It consisted of a blue-gray battledress jacket Type F-1 which could be worn with matching Type A-1 aviation slacks or Type A-1 nurse's aviation skirt. A Type C-1 garrison cap with maroon piping completed the outfit. The uniform could be worn with a powder blue shirt or with a white shirt, black tie, black shoes and black gloves. ... 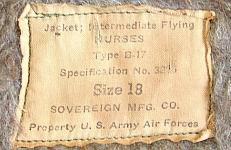 In 1944, the blue flight nurse's uniform was replaced by the dark olive-drab ETO uniform. Various different styles of the ETO battledress jacket existed. The picture below left shows a former service jacket converted to a battledress jacket by shortening the jacket, adding a broad belt at the waist and replacing the gilt Army buttons with simple brown plastic buttons.
. In January 1945, a special lightweight uniform made of tightly woven insect resistant khaki cotton twill was added for wear in tropical regions. It consisted of a Type K-1 battledress jacket with matching Type K-1 trousers. The jacket was buttoned at the front, had adjustable waist straps, detachable shoulder pads, two breast pockets with pointed pocket flaps and a pencil pocket on its left sleeve.
. 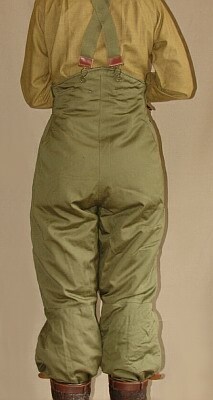 The flight nurse's intermediate flying suit, standarized in May 1944, consisted of a Type B-17 jacket and A-13 trousers. 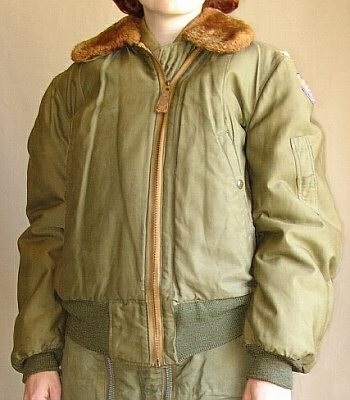 It was very similar in design to the standard B-15 jacket and A-11 trousers combination for male personnel. 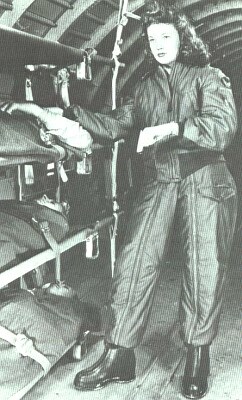 The flying suit was made of water and mildew-resistant olive drab cotton-twill outer shell and was lined throughout with alpaca- and woolpile fabric. 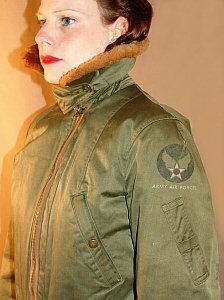 The jacket had a zipper front closure which was designed mirrowed to the male B-15 jacket closure. The collar was mounted and the wristlets amd the waistband were knitted. Note: The pencil pocket on the left sleeve has only one compartment while the pencil pocket of the men's B-15 has two. Collar closed with storm tab. . The cuffs of the trousers were knitted. On each leg, there was a zipper running the entire length. The trousers had a pocket on each thigh. An oxygen-bottle pocket with zipper was located in the outseam above the left knee. Unlike the men's A-11 trousers, there were no middle zipper, no pockets below the knees and no hip pockets. 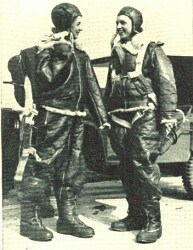 vv Flight Nurses wore the men's Type B-3 shearling jacket and Type A-3 shearling trousers as a high altitude outfit. The winter flying helmet Type B-6 was common headgear with this outfit. The nurses in the picture on the left probably wear the A-16 shearling overshoes which were very similar to the Type A-6 men's shoes but were smaller in size. In the picture the men's Shoe, Flying Winter, Type A-6A is shown which replaced the Type A-6 model in 1944.